Castlemount Ltd ID Card Printing services, Free advice. Castlemount Ltd ID Card Printing was established in 1987 as a Private Limited Company and 2018 marks our 31 Years in Business. Castlemount Ltd ID Card Printing specialisits, we maunfacturer only ID Cards and sell ID card accessories. We are members of the Federation of Small Businesses & registered under The Data Protection Act for the production of ID cards & storage of confidential data. We adhere to a strict Code of Conduct ensuring that we act professionally, honestly and fairly at all times. We have built a reputation as a reliable company and have a proven track record for going that extra mile, time and time again. The majority of our business comes from recommendations by our clients, past and present, small independent companies, sole traders, schools, charities, utility companies & multi-nationals. We offer nationwide coverage of the UK with next day service and on-line tracking of consignments. E-mail and the Internet have become an integral part of the way we conduct our business and regularly network with other EU countries. 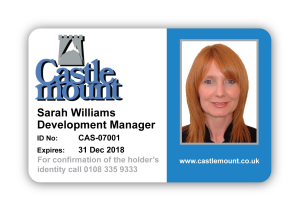 Castlemount Ltd ID Card Printing – Establish a long and lasting relationship with our clients by providing them with the best quality identification cards that will meet or exceed their requirements. Continue to provide excellent ongoing customer service and create a positive supplier client experience.